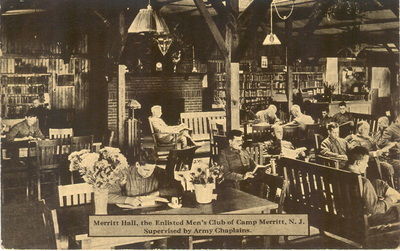 "Merritt Hall, the Enlisted Men's Club of Camp Merritt, N.J. Supervised by Army Chaplains." Handwritten note on back: "Dear Mother and Father, Gee! It's so great to be back here again and have some money so I can eat. That ocean ride or trip sure gave me an appetite. No, I did not get seasick and I am well, hope you are the same. Marion L. Taylor. "Addressed to: "Mrs. J.B. Taylor, 18424 Sloane Ave., Lakewood, Ohio". Merritt Hall, Camp Merrit, N. J.